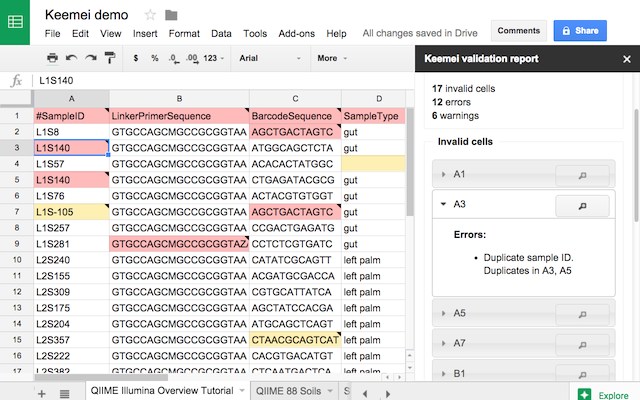 Keemei (canonically pronounced key may) is an open source Google Sheets add-on for validating tabular bioinformatics file formats, including QIIME 2 metadata files. Find the Keemei paper here. The following videos will help you get started with Keemei. There are also installation and usage instructions in the sections below if you’d prefer not to follow along with the videos. These videos were created by Riley DeHority and are provided by North Carolina State University’s Biotechnology Program (NCSU BIT), find their Youtube channel here. Click the blue button with the plus sign (+) to install the add-on. You will be prompted to give Keemei permissions that are required to operate. Once authorized, you’re ready to start using Keemei! Alternatively, you can install Keemei from within a Google Sheet by clicking Add-ons > Get add-ons... and searching for Keemei. Keemei displays validation status by modifying cell background colors and notes. If you use Keemei, you will lose ALL existing cell background colors and notes in the active sheet. There are future plans to minimize Keemei’s impact on your Google Sheets, but for the time being this is a caveat of using Keemei. How do I use Keemei? These data are for demonstration purposes only. Errors have been intentionally introduced to illustrate validation with Keemei. Do not use these data for analysis. Log in to your Google Account and install Keemei if you haven’t already. Open this Google Sheet. This is a publicly-viewable spreadsheet with the example data described above. Click File > Make a copy... and name your copy of the spreadsheet. You now have a copy of the example data to validate with Keemei. 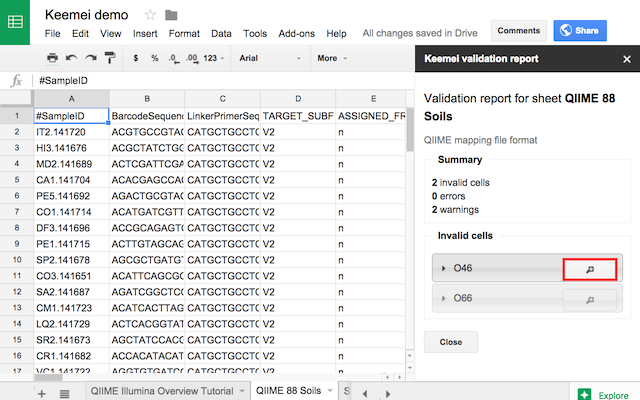 First we’ll see how to validate a QIIME 1 mapping file with Keemei. 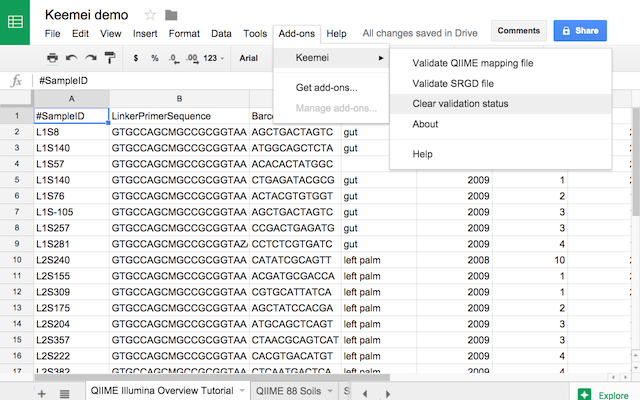 Make QIIME 1 Illumina Overview Tutorial the active sheet if it isn’t already. In the spreadsheet (not the sidebar! ), hover your mouse over cell A3. This is another way to find out why a cell is invalid. 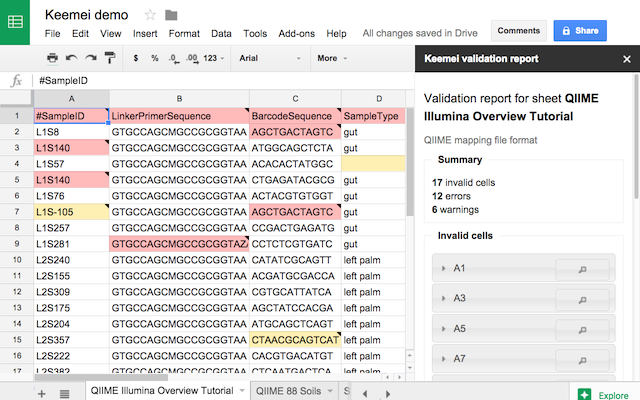 Make fixes to any number of invalid cells and re-validate by clicking Add-ons > Keemei > Validate QIIME 1 mapping file. Repeat this process until all cells are valid. Keemei’s sidebar provides a way to focus on an invalid cell in order to fix it. This feature is especially useful if you’re working with large sheets that would require scrolling to find and fix invalid cells. Make QIIME 1 88 Soils the active sheet. Validate this sheet by clicking Add-ons > Keemei > Validate QIIME 1 mapping file. Hit “Enter” after gaining focus to begin typing in the cell. In the previous sections we validated QIIME 1 mapping files. Keemei also supports validating SRGD files by clicking Add-ons > Keemei > Validate SRGD file. Validation results are displayed in a similar manner. Make SRGD_example the active sheet and try validating it as an SRGD file. How many invalid cells are there? How do I get help with using Keemei? To report an issue with Keemei or ask a question, please post to the QIIME 2 Forum. How do I update to the latest version of Keemei? Keemei will automatically update to the latest version available in the Chrome Web Store. Does Keemei work in “old” Google Sheets? Keemei is only officially supported in “new” Google Sheets. 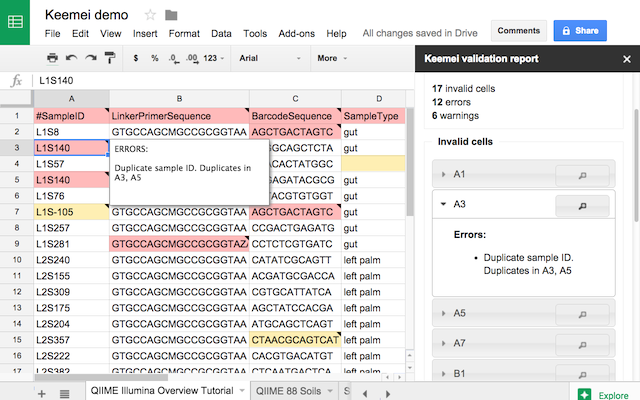 Keemei may work in “old” Google Sheets but this has not been tested. Support for “old” Google Sheets is not planned. When you run Keemei for the first time, you will be prompted to authorize Keemei with the following permissions. These permissions are necessary for Keemei to operate correctly (for more details about Google OAuth 2.0 Scopes, see this resource). 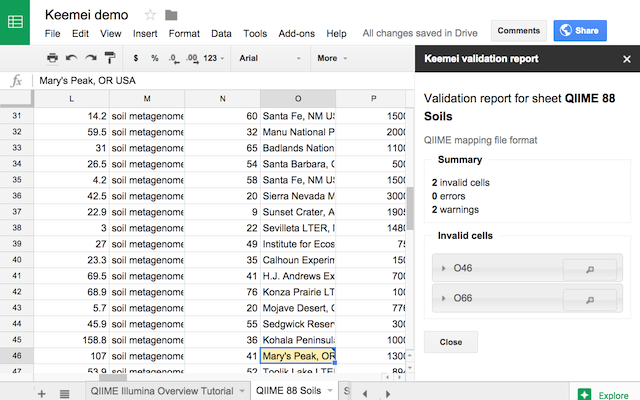 Keemei displays validation status by modifying cell background colors and notes in the currently active Google Sheet. Keemei will only access data in the current Google Sheet that it is executed on. Keemei will never create or delete Google Sheets in your Google Drive. Keemei does not store or share Google user data. Keemei uses Google Analytics to track add-on and website usage statistics. Keemei is a QIIME 2 project developed by the Caporaso Lab. See the full list of Keemei’s contributors on GitHub. Keemei was originally developed by Jai Ram Rideout (@jairideout) in the Caporaso Lab. Keemei’s logo was created by John Chase (@johnchase). Keemei is available under the new BSD license. See here for Keemei’s license. Keemei uses and distributes Moment.js, available under the MIT license. See here for Moment.js’ license. Powered by Jekyll using the SinglePaged theme by Tim O’Brien (t413.com). Icons powered by Font-Awesome. Favicon created with Dynamic Drive’s FavIcon Generator.